A RENAISSANCE IN HEALTH CARE! Click here to download a really nice Adobe .pdf file of this flyer. Medical training needs to become a true medical education so doctors learn how to care for their patients rather than treat diseases. 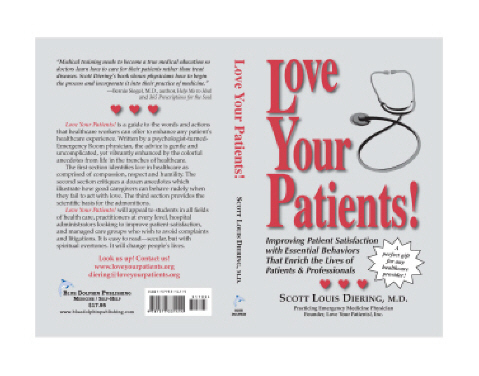 Scott Diering’s book [Love Your Patients!] shows physicians how to begin the process and incorporate it into their practice of medicine. Love Your Patients! is the perfect book for medical students, especially students preparing for the Step 2 Clinical Skills exam. This is an invaluable, inexpensive and enjoyable resource, for students and trainees at every level. Love Your Patients is a guide to the words and actions that healthcare workers can offer to enhance any patient's healthcare experience. Written by a psychologist-turned-Emergency Room physician, the advice is gentle and uncomplicated, yet vibrantly enhanced by the colorful anecdotes from life in the trenches of healthcare. The first section identifies love in healthcare as comprised of compassion, respect and humility. The second section critiques a dozen anecdotes which illustrate how good healthcare professionals can behave rudely when they fail to act with love. The third section provides the scientific basis for the admonitions. Love Your Patients will appeal to students in all fields of health care, practitioners at every level, hospital administrators looking to improve patient satisfaction, and managed care groups who wish to avoid complaints and litigations. It is easy to read--secular, but with spiritual overtones. It will change people's lives. Website Special! Order through the website, and I will sign your book, and pay shipping and any sales tax myself! 10% discount for 5 or more. Please ask about additional discounts on quantity orders. Add $7 s/h for first book + $3 for each additional. California residents add 7.375% tax.